For the past few months we have been thoroughly enjoying our share of fall harvest and pumpkin beers here at BlackOut Design. If we ventured out now however we may be hard pressed to find many of them still on shelves. Glad I started buying them up way back in August. August? Yes, pumpkin beer, in August. Seems to be just a tad bit early. Halloween was just three days ago. Thanksgiving and pumpkin pie are still too come. Most pumpkin patches weren’t even ripe until late September to early October. So where did all those pumpkins come from to brew these seasonal treats that early? It would appear that Rogue Brewery in Oregon also sees the error in such early releases. While many have been brewing their winter warmers and holiday spice beers (currently making their ways to distributors) Rogue was growing, harvesting and roasting their very own pumpkins at their Micro Hopyard in Independence, OR. Documented on Facebook and the Rogue Farms blog over 5000 lbs. of pumpkins were harvested in late September and immediately driven 77 miles from Independence to the brewery in Newport. From there they were cut, roasted and pitched directly in the brew kettle. The final product, a highly anticipated brew for us here at BlackOut Design, GYO Chatoe Rogue First Growth Pumpkin Patch Ale. Now, believe it or not, Rogue will ship their ales straight to you directly from Oregon. After a short delay in shipping thanks to hurricane Sandy we now have our supply of Pumpkin Patch Ale to finish out the season. 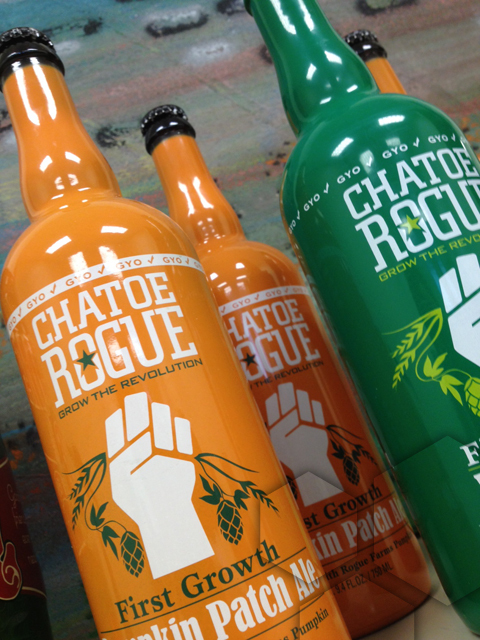 We also received a 2 bottles of Chatoe Rogue Wet Hop Ale. Another GYO made with six different varieties of GYO Certified hops grown on the Rogue Micro Hopyard. In a similar fashion to the pumpkins they are harvest, immediately driven 77 miles from the farm to the brewery and pitched directly into the brew kettle. For men who have a great taste in Rogue Ales, I know they are also selective when it comes to wallets. You can choose different styles at designer mens wallets. What is GYO? GYO means Grow Your Own. Not only were the pumpkins grown by Rogue, the hops and barley were grown on the very same farm. The end product is a first year release pumpkin ale brewed with ginger, vanilla bean, cinnamon and nutmeg with no chemicals, additives, or preservatives. Makes one wonder where all the pumpkins come from for those brewed in the late summer.